Palm has 3 AC bedrooms, 3 washrooms, one hall and beds for 10. We are a husband-wife team, native Goans. Joe was a news reporter for the print media but now does journalism. Marietta was a seamstress, now handled the guesthouse full-time. 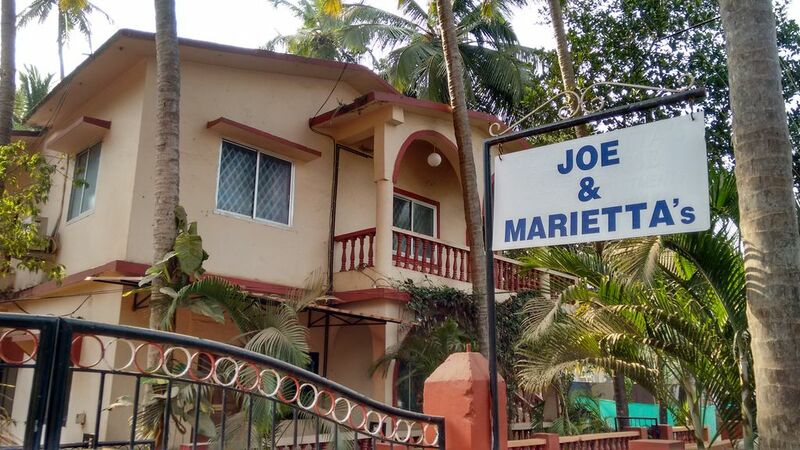 DOZEN REASONS WHY YOU MUST STAY AT JOE AND MARIETTA’S GUESTHOUSE, CALANGUTE, GOA ( RANKED NO. 3 OUT OF OVER 262 SPECIALITY LODGINGS IN CALANGUTE ON TRIPADVISOR 1. TripAdvisor guest reviews adjudged us as “Value for money” 2. Home-cooked complimentary breakfast 3. Free Wifi Zone 4. Cleanliness top priority. Daily house keeping 5. 24-hours hot/cold water 6. Laundry service available at low rates 7. Located in quiet residential area of Calangute 8. Yet close to main tourism spots of North Goa – 5 minutes to Calangute beach and 15 minutes to Baga beach on scooter 9. Inverter power back-up 10. We arrange pick-up and drop and also bikes, cars for your local travel, at actual cost (no commission to us). 11. We take care of your luggage before check-in and after check-out Free of Cost 12. Online payments and card payments accepted. Amidst trees of coconut, jackfruit, mango, cinnamon, etc.